Yves Caseau is Michelin Group CIO since October 2017. He was previously AXA Group Head of Digital, responsible for the development of innovative web and mobile experiences, as well as the digital coordination of Information Systems. 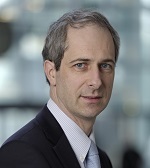 Yves Caseau has been Bouygues Telecom’s Executive Vice-President in charge of Technology, Services and Innovation from 2007 until 2013. His key responsibility was to design and to build “triple play” consumer products such as internet gateways and set-top boxes. He was Bouygues Telecom’s CIO from 2001 until 2006. He has taught the “Information Systems Theory and Practice” lecture at Ecole Polytechnique for three years and is a frequent speaker on information systems architecture. Yves Caseau has spent the first part of his scientific career – which started at Alcatel-Alstom – on software engineering, object-oriented programming and artificial intelligence. He then turned to operations research in 1990, first at Telcordia (New Jersey) then later at Bouygues, which he joined in 1994. He created Bouygues “e-lab” in 2000, which has become one of the best applied operations research labs in France as well as a recognized new technologies innovation center of excellence. A former student of the “Ecole Normale Supérieure” (82), he holds a PhD in Computer Science from Paris XI University (87) and an “habilitation (HDR)” from Paris VII University (95), as well as a MBA from the “College des Ingénieurs“. Yves Caseau is a member of the National Academy of Technologies, where he was appointed as the president of the ICT commission, and the author of books about information systems, lean management and enterprise organization.